A press conference was held last Thursday at the southeast corner of Dearborn Street and Madison Street to announce the city’s first pedestrian plan. Present were commissioners of transportation and public health, Gabe Klein, and Bechara Choucair, respectively, Metropolitan Planning Council vice president Peter Skosey, and various CDOT staff. After 20 minutes of speeches from Klein, Choucair, Skosey, and Active Transportation Alliance director Ron Burke, CDOT pedestrian program coordinator Suzanne Carlson and Klein applied a diamond shaped decal to a sidewalk corner across Madison Street. The bright yellow “sticker on the street” says, “Be Alert. Be Safe. We’re all pedestrians.” It’s part of the Pedestrian Safety Campaign launched last year that also included 32 mannequins scattered around Wacker Drive and then to other sites, as well as orange flags at certain crosswalks, and a somewhat grotesque ad campaign on trash bins and buses. Are Chicago’s pedestrian safety campaign posters too depressing? The posters began popping up in the Loop last year in October, around the same time the mannequins appeared on Wacker Drive. Most of them have pictures of pedestrians who were seriously injured or killed in a crash. Not real victims, of course, actors presumably, but the photographs are graphic. The people are lying unconscious in hospital beds, with neck braces, head bandages, facial lacerations, and IV tubes. One poster shows a crash occurring from a viewpoint within the car, with the driver’s head hitting the steering wheel and the victim’s body bouncing off the shattered windshield. Another shows a dead man, still sprawled on the street where he was killed. 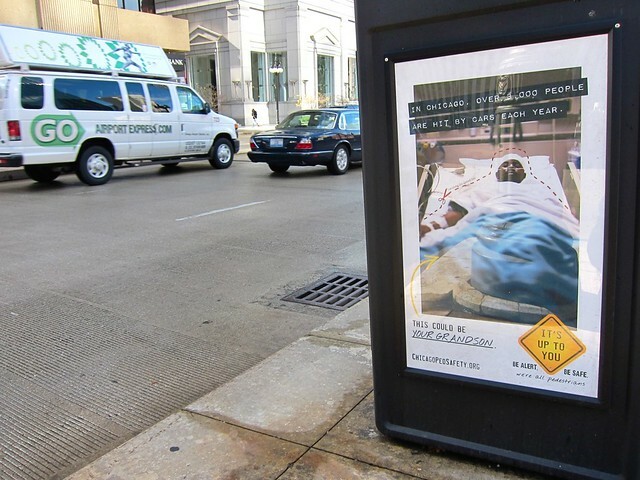 Continue reading Are Chicago’s pedestrian safety campaign posters too depressing? Posted on January 11, 2012 December 5, 2016 Author Michelle StenzelCategories Chicago, Design, People, Roads, WalkingTags pedestrian, Pedestrian Safety Campaign, safety19 Comments on Are Chicago’s pedestrian safety campaign posters too depressing? This fall the Chicago Department of Transportation (CDOT) used a shock-and-awe strategy to raise awareness of pedestrian safety issues. As part of its $495,000 “It’s Up To You” safety campaign, funded by a grant from the National Highway Traffic Safety Administration, CDOT placed scary ads on trash receptacles and buses, illustrating the devastating effects of reckless driving. The department also installed 32 dead-white mannequins along Wacker Drive representing Chicagoans killed by cars last year. CDOT’s latest ped safety initiative is also in-your-face, but in a kinder, gentler way. On December 8 the department zip-tied canisters of blaze-orange safety flags to poles at ten uncontrolled (no stoplight or stop sign) intersections near senior centers, schools and hospitals all over town. Since state law requires cars to stop for pedestrians in a crosswalk, you’re supposed to grab a flag, wave it to signal drivers to stop, cross the street and leave the pennant in the container on the other side. On the Monday three days after the flags were installed, I visited locations around the city to find out whether people were actually using the flags, or just stealing them. Continue reading Is anybody actually using Chicago’s new pedestrian safety flags? Posted on December 29, 2011 December 29, 2011 Author John GreenfieldCategories Chicago, Neighborhoods, Planning & Policy, WalkingTags CDOT, flags, Pedestrian Safety Campaign, safety, seniors14 Comments on Is anybody actually using Chicago’s new pedestrian safety flags? This city has a number of memorable el stops, like the O’Hare Line’s Damen station, with its fascinating view of Wicker Park’s buzzing North/Damen/Milwaukee “crotch,” and the sparkling-clean, Apple-sponsored North/Clybourn stop, complete with a sleek new seating plaza. But I love the Green Line’s 35th/Bronzeville/IIT station for two reasons. Just north, trains zoom through a super-cool, 530-foot stainless steel tube above the Rem Koolhaas-designed McCormick Tribune Campus Center. And while the Sox/35th Red Line stop is a madhouse after baseball games, CTA blackbelts know you can skip the crowds by strolling two blocks east to the nearly empty Green Line station.